Everyone has had a moment in their life where they’ve muttered to themselves, “Wow, where did the time go?” It may have been after a wild night of partying, or a great conversation with a friend, or while intensely concentrating on a project. Sometimes hours can feel like minutes, weeks feel like days, years feel like months. Time comes and goes, quickly vanishing into the ether. For those who lived during the years of 614 to 911 AD, a period of 297 years, it could feel like it never even happened. That’s because, according German historians Herbert Illig and Hans-Ulrich Niemitz, it never did. Let’s start at the beginning… the beginning of recorded time. The world’s oldest calendar is believed to date back to 8,000 BCE, according to the Royal Commission on Ancient and Historical Monuments in Scotland. Using lunar phases, hunters and gatherers developed a rudimentary calendar in the fields of Scotland to track the lunar months and changing seasons. As the world’s civilizations evolved, they each developed their own individual calendars based on lunar phases and harvest seasons. The Babylonian calendar began a new month when a crescent moon was first spotted low on the horizon in the western sky. The much-studied and complex Mayan calendar had twenty day months and two calendar years, the 260 day Sacred Round and 365-day Vague year. Every 52 years, these two calendars conceded and created a “bundle,” which was roughly equivalent to our modern hundred year century. As the Roman Empire rose through the last centuries of BCE, they brought their own calendar that they forced upon conquered foes. 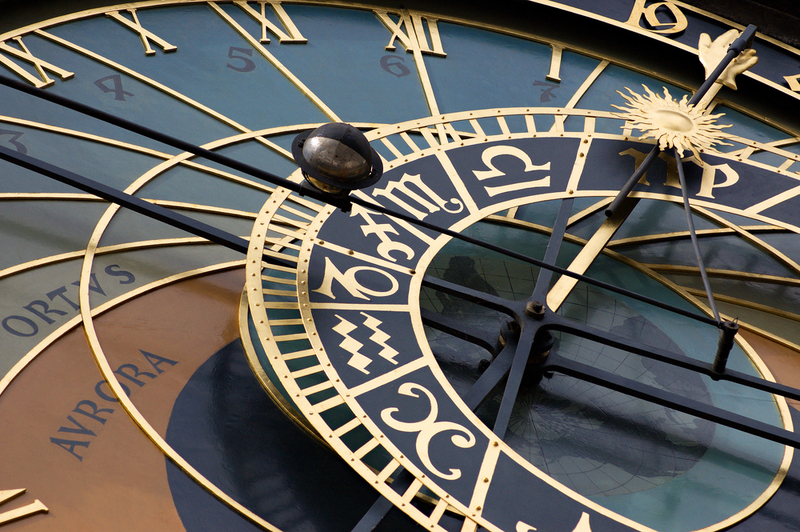 With the help of Sosigenes, a renowned astronomer from Alexandria, Julius Caesar helped develop a new calendar in 46 BCE, based on the Roman’s calendar. The Julian calendar was 365 days a year (with a leap day every four years) divided into twelve months. It was based on the sun (a tropical year), rather than the moon. Starting on January 1, 45 BCE, the Julian calendar was the predominant calendar in much of the world for the next 1600 years, until Pope Gregory XIII instituted the Gregorian calendar in 1582. The reason for doing this (besides power and influence) were three-fold: he wanted to make the sure the celebration of Easter would always coincide with the spring equinox; to erase the ten day error that had accumulated over the last 1600 years due to each year in the Julian calendar being roughly 11 minutes and 14 seconds longer than the actual year; and to change the leap year from every four years to 97 out of every 400 years (every 4.124 years) in order for the accumulation of days not to happen again. Pope Gregory’s revisions stuck and the Gregorian calendar is still in use today. A German historian by the name of Heribert Illig first published in 1991 that he believed that are actually 297 years missing from time, that we do not live in 2013, but rather 1716. These missing years were caused either “by accident, by misinterpretation of documents or by deliberate falsification.” Some missing time could certainly be accounted for due to the switching of calendars throughout the centuries that led to miscalculations and human error. Even after centuries, according to Illig, this missing time should only have amounted to days or months, not 297 years. In fact, one simple calculation revealed that Pope Gregory had made an error… it had been almost thirteen days, not ten, that accumulated over the 1600 years on the Julian calendar. This was clearly a human error, but a minor one at that. So the question remained, where did all that time go? Towards the end of the research paper, Niemitz asks the question that he knew would be at the forefront of the readers’ minds: “Who (and when and how and why) falsified history by adding 300 years?” He argues that the Catholic Church constantly falsified documents that upheld their theology, which, according to him, is well known in all historical circles, Who’s to say that they didn’t falsify documents that added time – days, months, years – in order for customs/relics/decrees to be perceived older than they actually were in order to add credibility to the relatively new religion? Another theory centers around the Roman Emperor Otto III and his desire to make sure his reign happened in 1000 AD to show that he understood “Christian milleniarism.” In order to do this, he had to falsify years to fill the missing time (and to invent Charlemagne in his image – who “lived” from 742-814 AD). Niemitz also hypothesizes (with the help of “famous Byzantinist” Peter Schreiner) that the Emperor Constantine VII had the entire Byzantine history rewritten and told his “transcribers” to destroy the originals. “It is not important to explain the motivation of the emperor Constantine VII. I only want to demonstrate, that an action of rewriting and faking like this has happened. If it could happen in Byzantium, it might have happened at any other place, too,” summarizes Niemitz. That last line from Niemitz is exactly why other historians believe that the phantom time hypothesis is hard to fathom. All of the evidence that both Neimitz and Illig cite is circumstantial. It is like the case for Santa Claus. If nobody has SEEN evidence that he doesn’t exist, he COULD exist. Taking all the information and evidence, it seems the answer to the question from the very beginning of “where did the time go?” is absolutely no where. In his research paper, Niemitz spends a lot of time proving that the methods used for scientific dating are not infallible and not “beyond the danger of circular reasoning.” One of method of scientific dating he pokes holes in is the practice of dendrochronology – the counting of tree rings. Niemitz explains, “Using this method one easily commits errors,” though he never gets into how one can commit errors. He also explains that finding “number of suitable samples of wood, which connect Antiquity and the Middle Ages is very small” making any assertions that 614-911 AD actually happened is not based on scientific fact. Discussion of the Phantom Time Hypothesis re-entered pop culture in November of 2013 during the fiftieth anniversary of John F. Kennedy’s assassination. On Grantland’s “The BS Report” podcast, sports and pop culture writer Bill Simmons had writer Chuck Klosterman and former MTV newsman/Rolling Stone writer Chris Connelly on to discuss the conspiracy theories surrounding JFK’s death. One of the theories Klosterman brought up, indirectly related to JFK, was the Phantom Time Hypothesis. He explained, while not getting the theory exactly right, there are 300 years that some scholars believe are unaccounted for. He attributed it to kings, emperors, rulers adding years to their reigns so that they lasted longer when history looked back. Is a Chunk of History Missing? OK. Sooooo… there’s no documentation. Then he’s saying it didn’t happen? It happened. The Muslims are there. So if the 600s-900s didn’t happen, then that means the Muslims took over Persia (and North Africa, and Spain, and nearly France) all on a single Tuesday. Wow. Their horses would be damned tired. Actually, this is a separate(but related) theory…that the spread of Islam was originally entirely Persian in origin, and that Chosroes II’s expansion into the Byzantine territories beginning in 602 AD IS the Islamic expansion. Only later, after the PERSIANS had spread Islam, was there an effective Arabic coup de’tat of the Persian Islamic Empire. Because by this point the Arabs would have been the dominant(in terms of population numbers) group in the Islamic empire. So, there was no ‘Arab conquest of Persia’ in the sense that a few hundred nomads on camels overran the most powerful Empire of the Classical world. And there’s NO documentation from any source of any such ‘Arab conquest’. There’s also NO documentation that people called Mohammad, or any of his ‘Rightly Guided Caliphs’ ever existed. Meanwhile all early Islamic architecture, pottery etc. is quintessentially Persian, Islamic writings appear on Persian coins more than 20 years before Mohammad was supposed to have made his famous flight to Mecca, and the big one…..the Islamic symbol of a crescent moon enclosing a star originates not in Arabia, but in…..you guessed it…Persia. So, after the Arabs had taken over the original Persian Islamic empire, they wrote a new bogus history that thoroughly Arabized the history of the religion, including creating a fictitious Arab founder. There are books detailing this in minute detail, explaining this far better than I have here. The end result of this is that the Persian conquest of the Arabian Peninsula, North Africa, Anatolia etc. of 602-614 IS the Muslim conquest of the Arabian Peninsula, North Africa, Anatolia etc. So then the Persians were part of the conspiracy too? Cuz they would have had to invent Mohammed. I don’t know too much about this theory but instead of saying it took place on a Tuesday. Wouldn’t it make more sense to say the worlds calenders where just aligned wrong. Pushing the rest of the worlds timeline forward to match the claimed year of the new calender?
. Pope Gregory’s revisions stuck and the Gregorian calendar is still (in) use today. you forgot the ‘in’. I think you misunderstand. Time never ‘Went anywhere”, and there are no “missing years”. Saying that the idea is that “the years between 614 and 911 never happened” is NOT what Phantom Time is saying at all. You see, the one error in your piece is the idea that after 44BC the Julian calendar became widespread or common. Simply not true. Every people, group etc. had their own Calendar, and their own “Starting point”, usually based around the founding of a town, the birth of a King etc. There were thus numerous different dating systems, no two the same. A little over a thousand years ago, the Christian Church decided to create a universal calendar for all of Europe and Christendom, using the year of Jesus Christ’s birth as “Year 1”. This is the system we use today. At the time, the Church and only the Church could read and write. You know how in Monty Python’s Holy Grail the normal people know that Arthur is the King? That’s pretty much it. Even Kings and Queens were illiterate. Most people only knew their own age, and that of their immediate family members. Local dating was often based around how long a king had been on the throne. So anyway, the Pope, the Patriarch of Constantinople, and various Church elders got together with all their written documentation, and decided that it was the Year 999 AD(using Jesus’ birth as 1 AD). They then destroyed most of the existing documentation, and started dating from this point on, so that the next year was 1000AD, the next year was 1001 AD, right up to today it’s 2015 AD. The same Church then also spent the next years assigning a date to every Battle, Council, reign of every King, Pope etc. using this new AD calendar. And at the time, 99% of the people didn’t even know or care about this. It was only hundreds of years later, when this AD calendar was established that the Renaissance happened, and normal people would now study history or archaeology. And straight away the scholars realised that there were hundreds of years where the Church’s history was screwy. This period was called ‘The Dark Ages’, because the amount of actual evidence is slim to none. What Phantom Time says is that if Jesus’ birth is Year 1, then the Year that was dated 999AD is wrong, and is more like 700AD. And that there are approximately 300 years too many in the AD chronology from 1AD to 999AD. It doesn’t say that it’s a specific 300 years. All it says is that two events dated to ‘614’ and ‘911’ probably took place a lot closer to each other than the 297 years that we are told they did. It’s funny that people can laugh at this, yet if you ask those same people why we say it’s ‘2015’ today, and when we started measuring time like that, they’d be clueless. The fact is:the entire chronology from 1 AD to 999 AD was created by a group of Church people a little over a thousand years ago, and anytime anyone questions its accuracy, they are called tinfoil hatters. Best explanation of anything I have ever read anywhere. Kudos to you. So you’re saying that because the Church had a monopoly on literacy, that made it easier to create 3 centuries worth of documents? No, that made it *harder*. Literacy was limited because the technology to produce books was *expensive*.It used expensive materials and intensive labor by highly trained individuals. Even if the small literate cadre could abandon all their other responsibilities (they couldn’t) and find the materials (not enough sheep in all of Europe to provide the vellum), the idea that they could all just sit down and produce all those documents in any reasonable time is absurd. Dude…you just blew my mind. Thank you. The eclipse record agrees with Illig and more or less proves him correct beyond reasonable doubt. According to Roman authors such as Dio Cassius a total eclipse of the sun was seen on April 58 AD in Rome during the funeral of Nero’s mother (whom he had murdered, incidentally). Modern science however tells us that NO eclipse was visible in Rome at that time and scholars are puzzled by the Roman authors’ references to it. However, precisely 300 years closer to our time, in what we would now call 358 AD, science tells us that a total eclipse WOULD have been visible in Rome, and it occurred in the springtime. The case is basically closed. Illig is right: we’re in the year 1716. To dot an “i”: you wrote “the celebration of Easter would always coincide with the spring equinox”. However, Easter does not coincide with the spring equinox but is linked to it: it’s the first Sunday after the first full moon after the equinox. For the rest, I cannot fathom how people take this seriously. Is the archaeological record false? Are radiocarbon dating and dendochronology false? Or were the Powers-that-Be at the time so prescient that they faked the C14 content of organic material and added 300 extra tree rings?